Part of the Moon series from Avalon Travel Publishing. An essen­tial guide­book for would-​​be and brand new expa­tri­ates embark­ing on a new life in Canada. The book’s mate­r­ial is pre­sented in an eas­ily read­able for­mat and cov­ers all the impor­tant aspects of daily life in Canada.…(includ­ing) the var­i­ous visa options for Americans inter­ested in mov­ing to Canada, …hous­ing, obtain­ing a social secu­rity num­ber and driver’s license, the national health sys­tem and health insur­ance, edu­ca­tion, employ­ment, finance and bank­ing, com­mu­ni­ca­tions, and transportation. 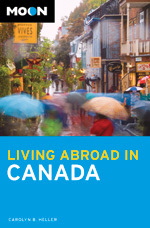 For any­one inter­ested in liv­ing in Canada, “Living Abroad in Canada” is a well-​​researched and prac­ti­cal com­pan­ion that pro­vides all the infor­ma­tion and resources you need to make a suc­cess­ful move. A must-​​have book for any­one con­sid­er­ing relo­cat­ing to Canada for school, work or retirement. Some U.S. cit­i­zens fed up with life in the States have con­sid­ered mov­ing north to Canada. This book offers detailed infor­ma­tion that explains the dif­fer­ences between the North American neigh­bors. Carolyn Heller, a U.S. cit­i­zen who lives in Vancouver, offers advice on obtain­ing visas, arrang­ing finances, gain­ing employ­ment, choos­ing schools, apply­ing for health care, and how to buy or rent a home. The book also offers maps and overviews of such prime liv­ing loca­tions as Vancouver, British Columbia, Toronto, Ontario, Quebec, and Alberta. This book pro­vides first­hand advice on obtain­ing visas, arrang­ing finances, gain­ing employ­ment, choos­ing schools, and apply­ing for health­care. It seems that quite a few Americans con­sider Canada the 51st state. Author Carolyn B. Heller aims to put that idea to rest. Although the United States and Canada have much in com­mon, Heller is quick to point out that Canada has its own dis­tinc­tive cul­ture with its own cus­toms, lan­guages and idio­syn­crasies. Canada has slightly more than 33 mil­lion peo­ple, but nearly three-​​quarters of them live within 100 miles of the U.S. bor­der. She dis­cusses hous­ing con­sid­er­a­tions, the Canadian health sys­tem, employ­ment and finance while offer­ing sug­ges­tions on prime liv­ing loca­tions. She con­trasts the American melt­ing pot with the Canadian mul­ti­cul­tur­al­ism, where var­i­ous eth­nic groups live side by side in a mostly mul­ti­eth­nic har­mony. To cite just one exam­ple, Heller pro­files an annual din­ner and per­for­mance event in Vancouver — dubbed Gung Haggis Fat Choy — that cel­e­brates the city’s Chinese and Scottish her­itages and where peo­ple gather for a Chinese-​​style ban­quet to savor such del­i­ca­cies as hag­gis won tons. Only in Canada. If you’re con­tem­plat­ing a move to another coun­try, you need to con­sult Moon books, the prime source for relo­cat­ing to for­eign lands. Avalon Travel has just pub­lished three new books in the series: Living Abroad in Canada, Living Abroad in New Zealand and Living Abroad in Australia. Each vol­ume is packed with essen­tial infor­ma­tion rang­ing from plan­ning a fact-​​finding trip to his­tory, gov­ern­ment, prime liv­ing loca­tions, employ­ment oppor­tu­ni­ties, health resources and a French phrase­book for Canada.